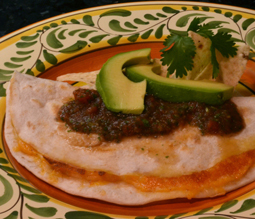 Mrs. A's Quesadillas - A recipe from Savor California, the online showcase for extraordinary gourmet foods and beverages from California. Place one flour tortilla on a griddle pan or fry pan. Top with cheese, and add any other favorite ingredient. Mrs. A's family loves shredded cooked chicken, fresh diced tomatoes, diced green chiles. Top with another flour tortilla. Cover with foil and cook on medium until golden brown. Cut into large wedges and serve with Mrs. A's Famous Salsa Buena, avocado, and sour cream.